Dr. Jaideep Mukherjee (aka Dr. Aiki by his Aikijujitsu friends) began his martial arts journey in India in 1979 as an undergraduate student by training in Shotokan Karate for 3 years. His inspirations (as for many at that time) were Bruce Lee, Chuck Norris and other martial artists. At that time, he also led the University gymnastics team in his final year and won a number of team and individual medals at an Inter-University meet. Dr. Mukherjee also had the distinction of winning the Mr. IIT (Best Physique competition) in 1983-1984, and was a runner-up in the Inter-University competition. In 1988, he came to the U.S.A. for graduate studies and began doing Tai Chi in Newark, Delaware. There he met Karen, his practice partner, friend and now, his wife of 12 years. In 1990, he moved to the University of Illinois at Urbana-Champaign for his Ph. D. while continuing to train in Tai Chi for another year. Some time in 1991, Jaideep and Karen discovered aikido and have been practicing it ever since. Their dojo was the Central Illinois Aikikai which was part of the Midwest Aikido Federation (under the supervision of Shihan Akira Tohei, 8th degree black belt). In aikido, Jaideep and Karen found a good compromise between the "hard" karate and "soft" tai-chi. While part of the Midwest Aikido Federation, Jaideep tested for all his Kyu levels by Shihan Tohei and passed the First Kyu (brown belt) exam in 1996. After earning his doctorate, the Mukherjees moved to Houston in order to pursue their career paths. In Houston, Jaideep and Karen joined the Tumbleweed Aikikai which was a member dojo of the United States Aikido Federation's Eastern Region under Shihan Yoshimitsu Yamada, 8th dan. This dojo eventually disbanded and was reconstituted as a member dojo in the Aikido Association of America under Shihan Fumio Toyoda, 6th dan. Shihan Toyoda passed away a few years later and Jaideep and Karen are privileged to have been at his last Instructors' Seminar held in Chicago in April 2001. At this seminar, Jaideep was awarded the title of "Jyoshu" ("Assistant") by Shihan Toyoda. In October 2001, Jaideep and Karen decided to take their aikido studies in a new direction by coming under the supervision of Hiroshi Kato, 8th dan, from Tokyo, Japan. In March of 2002, Jaideep was awarded his first degree black belt by Kato Shihan. 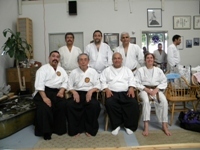 In the fall of 2004, Jaideep and his wife Karen decided to join the Shudokan School of Aikido in order to help Sensei Jorge Garcia establish Aikido in northwest Houston. In October of 2004, Jaideep took his Nidan exam and was awarded his 2nd degree black belt by Kato Shihan. Karen also passed her first-degree black belt exam in May 2003 and second-degree black belt exam in January 2007. Dr. Aiki tested for and passed his third-degree black-belt exam (san-dan) in March 2009 at a seminar taught by Shihan Hiroshi Kato. Dr. Aiki holds a black belt in Muso-Shinden Ryu iaido (Japanese sword art form). Both Dr. Aiki and Karen Sensei also hold black belts in Daito-Ryu Aikijujitsu Roppokai. Dr. Mukherjee has a Ph. D. in Regional Planning from the University of Illinois at Urbana-Champaign, a Masters Degree in Operations Research from University of Delaware, another Masters in Management Science from University of Pune, and a Bachelor of Engineering Degree from IIT New Delhi. Karen holds a Bachelor of Fine Arts degree from University of Delaware with concentration in painting and photography. Jaideep works as an Application Services Manager in the Information Technology Department at Star of Hope Mission, and is responsible for building and maintaining database-backed web or desktop applications. Besides teaching and training in aikido, his other interests include continuing practice in martial arts of Tai-Chi, Daito-Ryu Aikijujitsu Roppokai, and Muso Shinden Ryu Iaido. Karen also practices Tai-Chi and Daito-Ryu Roppokai. To balance their very active, busy lifestyles, they also practice meditation, as inspired by Buddhist and Christian contemplative traditions. Karen likes to paint, dance and do photography. They both love the outdoors and are avid hikers.